The 50 metre motor yacht La Pellegrina, listed for sale by SSH Maritime and Merle Wood & Associates, has been sold with Interglobal Yachts introducing the buyer. La Pellegrina was built in carbon-reinforced Kevlar by French yard Chantier Naval Couach to a design by Exequiel Cano Lanza and delivered in 2012 as a Couach 5000 Fly model. An exquisite interior design by Jean-Pierre Fantini accommodates 12 guests in six cabins consisting of a master suite on the upper deck, a VIP suite on the main deck and three doubles with queen beds and a twin below deck. Each cabin has an entertainment centre and marble en suite bathroom facilities. The open plan saloon, with floor to ceiling windows, is flooded with light. It has a large lounge area with port and starboard settees, coffee tables and an entertainment centre with a low credenza separating it from a forward formal dining area with seating for 12 guests. She is powered by twin 5,240hp MTU engines giving her a maximum speed of 28 knots, a cruising speed of 25 knots and a transatlantic range. Sea Keeper gyroscopic stabilizers ensure that there is minimal roll motion at sea and in port. 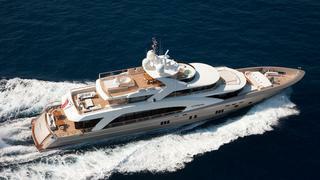 Lying in Fort Lauderdale, Florida, La Pellegrina was asking €21.9 million.